It is interesting that Christ has his hand down in the direction of the betrayer Judas Iscariot. 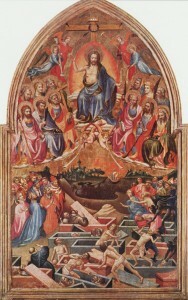 There are many more examples of Christ in this posture, including The Last Judgment by Hieronymus Bosch (ca. 1482). An interesting variation in these examples is that some depict the right hand not only with palm up, but with the right arm upraised also. 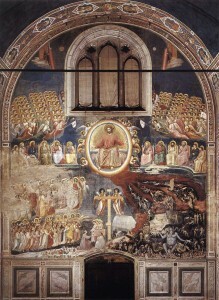 The Last Judgment by Michelangelo in the Sistine Chapel is a famous example. The Tympanum (West Portal) of The Last Judgment to the Church of Ste. 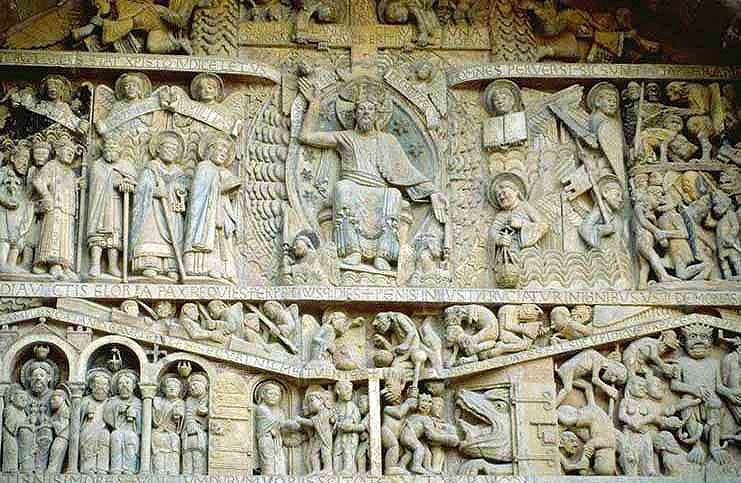 Foy at Conques, France, also shows Christ with a raised right arm towards the saved, and a lowered left hand towards the damned. 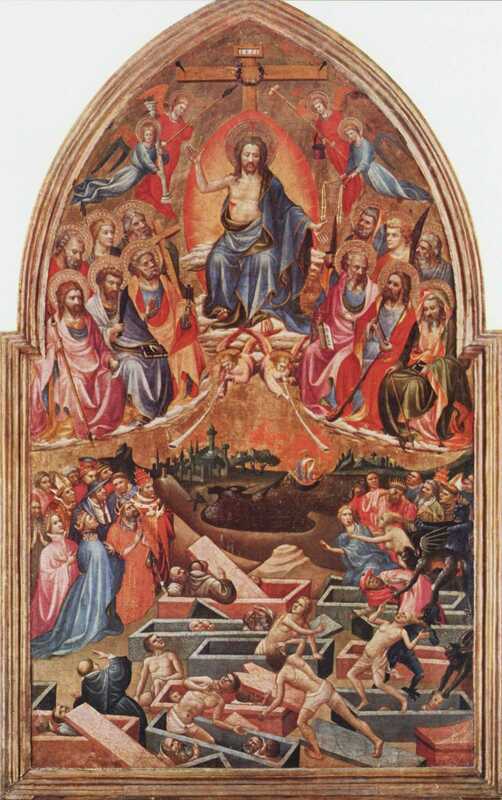 One particularly nice example of this variation is The Last Judgment by Master of the Bambino Vispo (ca. 1422). This posture again appears in Hans Memling‘s depiction of The Last Judgment (ca. 1467-1471). It is also interesting that this posture is also found in other cultures and traditions, particularly in the mudra gestures of Buddhism. So it would seem that in addition to the incense filled hand found in ancient Israel, the palm up/palm down symbolism does have a place in Christianity, especially in Christian art. The palm up seems to depict blessing, receiving, mildness, mercy, and salvation, while the palm down seems to depict damnation, severity, justice, judgment, rejection, condemnation, and sin. At least that is what the Christians in the Middle Ages and Renaissance might have believed. This is some good stuff! Does any of the art work ever portray the opposite–right palm down left palm up? Great research, Bryce! You came up with that quick! I guess I wasn’t making that up–I knew I had read something about palm up being mercy and palm down being justice. I’m glad you put together such an awesome post on the topic. Thanks guys. 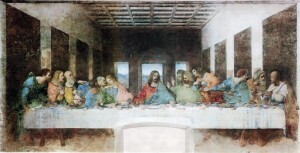 The only piece that portrays the opposite that I found was Leonardo da Vinci’s The Last Supper. He seems to have done things a little different anyway. Perhaps he was imitating the others by mirroring. I wonder if the palm up/down in judgment are also utilized in the Egyptian ‘the weighing of the heart.’ (eg. http://www.xaprb.com/blog/wp-content/uploads/2007/11/weighing_of_the_heart.jpg) In this papyrus, the initiate is dressed in white and is being led by Anubis toward the place of judgment. The heart of the deceased initiate is weighed on the scales against the feather of Maat (Truth). I’m not an Egyptian expert, but it seems that Anibus (while on the scale) holds his right hand down while he steadies the scale with his upraised left hand. If the initiate passes the judgment successfully, he is then led to a partition and petitions Osiris to let him come into his presence. Allen Fletcher references this papyrus in his discussion of Abraham Fac. 3 in his book “A Study Guide to the Facsimiles of the Book of Abraham” and concludes that Fac 3 is similar to the right part of this papyrus dealing with being in the presence of Osiris. “This posture again appears in Hans Memling’s depiction of The Last Judgment (ca. 1467-1471). 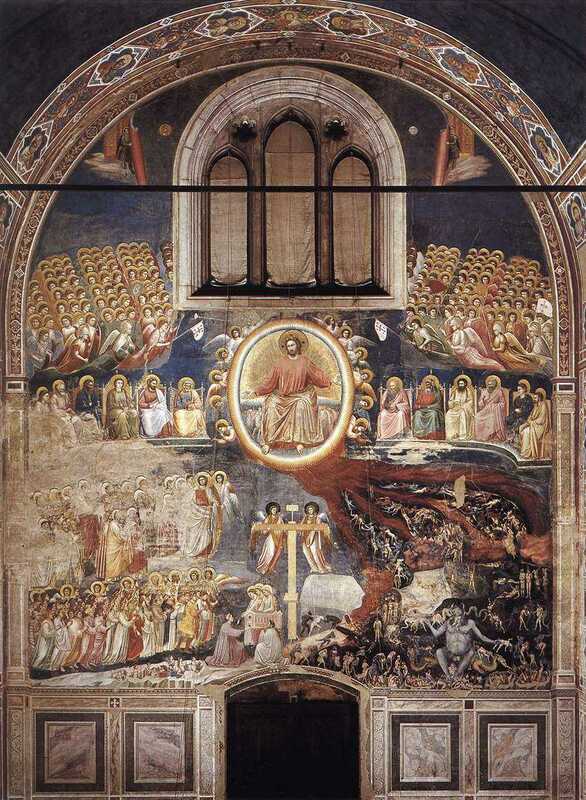 Notice what’s happening on the left-hand side of the painting as the righteous prepare to enter heaven. Peter, the gatekeeper, holding his massive key, checks to see if those trying to enter heaven have the proper “keys” to do so. After they pass him, they are appropriately clothed by angels. Great point, EditorJack. Memling did capture some other interesting details. Here is a closeup of Peter and his keys. Here is a closeup of the saved being clothed and crowned by the angels as they enter the heavenly temple. Great responses here. Thank you all. Question: I have heard that anciently keys were fashioned in the form of a hand. Has anyone heard of this before? I haven’t heard of keys shaped as hands, but this scripture of Isaiah does come to mind; two related ideas are government in the hand and keys on the shoulder. “21 And I will clothe him with thy robe, and strengthen him with thy girdle, and I will commit thy government into his hand: and he shall be a father to the inhabitants of Jerusalem, and to the house of Judah. “As the robe and the baldric, mentioned in the preceding verse, were the ensigns of power and authority, so likewise was the key the mark of office, either sacred or civil… This mark of office was likewise among the Greeks, as here in Isaiah, borne on the shoulder; the priestess of Ceres, katwmadian ece klaida, had the key on her shoulder… To comprehend how he key could be borne on the shoulder, it will be necessary to say something of the form of it: but without entering into a long disquisition, and a great deal of obscure learning, concerning the locks and keys of the ancients, it will be sufficient to observe, that one sort of keys, and that probably the most ancient, was of considerable magnitude, and as to the shape, very much bent and crooked. Aratus, to give his reader an idea of the form of the constellation Cassiopeia, compares it to a key. It must be owned that the passage is very obscure; but the learned Huetius has bestowed a great deal of pains in explaining it, Animadvers. in Manilii, lib. i. 355; and I think has succeeded very well in it. Homer Odyss. xxi. 6, describes the key of Ulysses’ storehouse as eukamphv, of a large curvature; which Eustathius explains by saying it was drepanoeidhv, in shape like a reaphook. Huetius says the constellation Cassiopeia answers to this description; the stars to the north making the curve part, that is, the principal part of the key; the southern stars, the handle. The curve part was introduced into the key-hole; and, being properly directed by the handle, took hold of the bolts within, and moved them from their places. We may easily collect from this account, that such a key would lie very well upon the shoulder; that it must be of some considerable size and weight, and could hardly be commodiously carried otherwise. Ulysses’ key was of brass, and the handle of ivory: but this was a royal key. The more common ones were probably of wood. In Egypt they have no other than wooden locks and keys to this day; even the gates of Cairo have no better. But was it not the representation of a key, either cut out in cloth and sewed on the shoulder of the garment, or embroidered on that part of the garment itself? I was reading 1 Nephi 14 the other night when a phrase of verse 7 caught my attention as relating to the palm up/palm down theme. The Spirit had been talking about the need to repent, then that God would work a “great and a marvelous work…which shall be everlasting, either on the one hand or on the other—either to the convincing of them unto peace and life eternal, or unto the deliverance of them to the hardness of their hearts and the blindness of their minds unto their being brought down into captivity, and also into destruction ….” The idea of two hands and judgment are brought together. Next, verse 15 jumped out, “the wrath of God was poured out upon that great and abominable church….’ If wrath were poured out, it must have been previously contained in a vessel, cup or cupped hand until it was poured out. Even a cup would likely be carried by a hand, involving the hands in the symbolism. Jump to 2 Nephi 8. When covenant Israel was wicked the Lord declared, “Awake, awake, stand up, O Jerusalem, which hast drunk at the hand of the Lord the cup of his fury—thou hast drunken the dregs of the cup of trembling wrung out” (2 Ne 8:17). The Lord’s promise to those who are His people: “Thus saith thy Lord, the Lord and thy God pleadeth the cause of his people; behold, I have taken out of thine hand the cup of trembling, the dregs of the cup of my fury; thou shalt no more drink it again. But I will put it into the hand of them that afflict thee” (2 Ne 8:22–23). During the Lord’s atonement in Gethsemane, He drank the bitter cup (Matt 26:39, D&C 19:15–18). If the Lord’s judgment is for “peace and eternal life,” might not His hand hold the cup of wrath upright, drinking the wrath himself and meeting the demands of justice through His own sacrifice. If the judgment is to deliver them to the “hardness of their hearts” and “destruction,” might the hand turn the cup over to pour out the wrath; His atonement for sin not being applied to that person who then has to “drink the dregs of a bitter cup” for himself (Alma 40:26, see also Ps 11:6, 75:8). Another level of symbolism may be the sacrament wine which represents the atoning blood which the righteous may drink from a cup with the Lord (see Matt 26:28–29; D&C 29:5; Ps 16:5), even a cup in the Lord’s hand (Ps 75:8). If we drink of His atonement, we will receive mercy, and He has already drunk of the dregs and wrath caused by our sins. “But God is the judge: he putteth down one, and setteth up another” (Ps 75:7) “either on the one hand or on the other” (1 Ne 14:7). Very interesting insights Ferreira. Thanks for sharing them! Could this be what Alma was referring to in his great sermon to the Zoramites in Alma chapter 32?